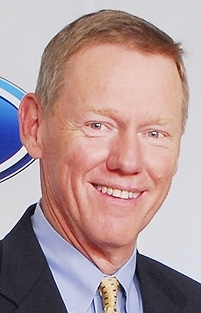 DETROIT -- Ford Motor Co. CEO Alan Mulally late Sunday praised the incoming Obama administration, but said he hopes that any car czar appointed to oversee industry restructuring refrains from product dictates. The remark came after a question about whether such a car czar could end up determining which one of the Detroit 3 companies would build next-generation police cars or taxis. The appointment of a car czar, however, is an important move, Mulally said. I know this is going to sound like Im a masochist or something, but Im very gratified -- its been kind of hard -- but that weve gotten to a place where theres appreciation for the automobile industry in the United States, he said. Mulally said hes encouraged by president-elect Obamas understanding of the challenges facing the industry. Ive been very pleased with the fact that it seems like he really understands that dealing the economy is a very, very high priority, Mulally said. Ford executives say they are hopeful that Obama will put together a broad national energy policy that aligns consumer behavior with social interest on energy use. To have a policy where were trying to jam products out that people dont want doesnt make any sense at all, Mulally said. But Mulally balked at saying that higher federal gasoline taxes are the answer. While such a tax increase might be one piece of a comprehensive energy policy, were not presumptuous enough from the automobile industry frankly that we should lay out the energy strategy of the United States, he said.